STARTLING EVIDENCE GIVES NANCY A NEW PERSPECTIVE ON THE FINE ART OF MURDER. Nancy's spending Thanksgiving in Paris, the city of light, love.. .and mystery. Her neighbor is Ellen Mathieson, a professor whose study of painter Josephine Solo has suddenly taken a dark and disturbing turn. Ellen's research assistant is dead -- killed in an accident exactly like the one that took Solo's life six months before! Josephine Solo left a legacy of secrecy and scandal. . .even the possibility of a double life. But Nancy begins to suspect that some of the professor's students also have something to hide. Paris is full of powerful temptations -- forbidden romance, secret passions, financial greed -- any one of which could lead to a motive for murder. "HOLD IT, Nancy -- right next to those gorgeous plums. They're the exact shade of your coat!" 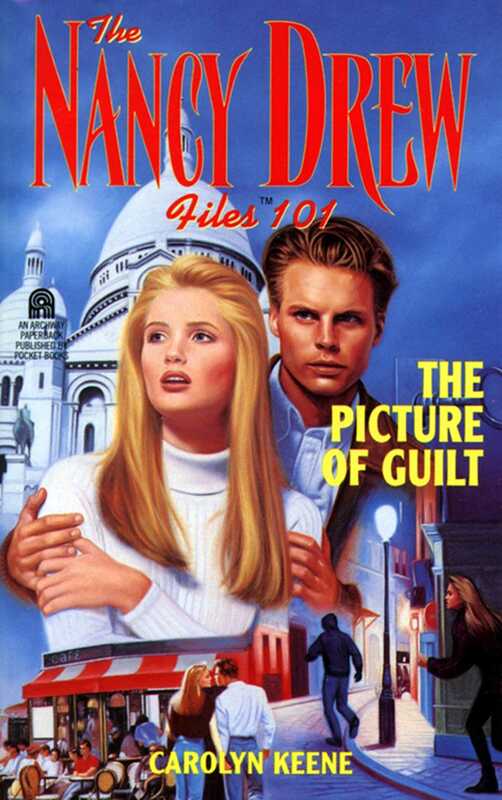 Nancy Drew brushed her reddish blond hair from her face. She and her friend, George Fayne, were getting a firsthand look at a Paris street market in action. A crowd of shoppers flowed slowly between the two rows of stands that lined the block. The tables were heaped high with colorful fruits and vegetables. George had stopped a few feet before Nancy to aim her pocket camera. "I can't get everything in," she complained, taking a step back. Then she added, "Oh, pardon, monsieur," as she bumped into a middle-aged man whose straw shopping basket contained several zucchini, some purple onions, and a bushy head of lettuce. "Take one picture of me and another of the veggies," Nancy suggested, laughing, "and save some film for that fish store we just passed. Did you see all those crabs and lobsters? And the other shellfish -- I don't even know the names of most of them." George pressed the shutter release, then moved over to Nancy's side. "Well, if you find out, don't ever serve them to me," she said with a shudder. "Some of them were really ugly. I wouldn't want to meet them in a bad dream, never mind on a plate!" "Don't worry," Nancy said, patting her friend's shoulder. "Dad's taking us out to dinner tonight. We'll tell him we want a place that doesn't feature shellfish." Nancy's father, attorney Carson Drew, had come to Paris to settle the estate of a client. His old friend, Robert Morland, who owned a big apartment in Paris, offered to let him use it during his stay. He invited Nancy to come with him and bring her two best friends. Nancy's other close friend, Bess Marvin, already had plans to spend Thanksgiving with an old friend, so reluctantly she turned down the invitation. George was delighted to accept. The two girls had arrived at Charles de Gaulle Airport that morning at seven-thirty French time, which was still the middle of the night in River Heights. After a short rest and some freshening up at their apartment, they set out to explore the neighborhood, which was east of the Place de la Bastille, while Nancy's father went to an appointment. George peered doubtfully at the string shopping bag on Nancy's arm. "Plums, apples, oranges, lettuce -- you're not buying much," she commented. "Don't you think we ought to find a supermarket and stock up for the next few days?" "Don't be silly," Nancy replied with a grin. "In Paris, people shop practically every day. That way, their food is always superfresh. Let's pick up some cheeses, a couple of pat&eacute;s, and a baguette. On the way back, we can stop at that little coffee-roasting shop we noticed and buy some tea and coffee. Then tomorrow we'll toss to see who goes out to get fresh baked croissants for breakfast." "You mean they don't deliver?" George joked. "I'm crushed!" A few minutes later the girls had bought every thing they needed. After stopping to admire a stand piled high with roses, they made their way through the crowd of shoppers to the main street and the five-story building where they would be living for the next couple of weeks. The building was in the form of a hollow rectangle, with a long, narrow courtyard paved with cobblestones down the center. They entered the courtyard and were starting up the stairs, when Nancy noticed a woman of about thirty-five coming down the stairs toward them. Her dark brown hair was cut in a short, asymmetrical style, one side chin length and the other an inch or so shorter. She had set off her turquoise wool jacket with a bright yellow silk scarf, casually knotted at her neck. "Hello," the woman said. "You must be Bob Morland's guests. He told me to look for you. I'm Ellen Mathieson. I live just above you." After Nancy and George introduced themselves and shook hands with her, the woman continued, "I was planning to knock on your door. I'm an American college professor, teaching and directing an exchange program for American students here. I'm having an open house this evening for our students. Would you like to come by and meet them? If you're not too jet-lagged, that is." "Thanks very much," Nancy said after a quick glance at George. "It sounds like fun." "Great. Anytime after eight," the woman said. "I'm off to buy some supplies before the market closes for lunch. See you this evening." By the time George, Nancy, and Carson got back from dinner at a lively neighborhood bistro, it was nearly nine o'clock. The door to the courtyard was locked every evening after eight, but Carson punched in the code on the keypad next to it. The lock clicked, and they entered the courtyard. Nancy heard a buzz of voices from Professor Mathieson's apartment. Carson had to look over some papers, so Nancy and George dropped off their coats, then went up one more flight and knocked on Professor Mathieson's door. She opened the door. "Nancy, George," she said with a big smile. "I'm glad you could make it. Come in and meet the gang." At the end of a short hallway was the dining room. The table had been pushed back against the wall to make more space. Professor Mathieson led Nancy and George to a little group standing near the table. "Everybody. These are my new neighbors, George Fayne and Nancy Drew," the professor said. "Meet Pamela and David Fieldston and Keith Astor." Pamela and David both were about twenty, and they both had blond hair, roundish faces, and upturned noses. "You two are related, right?" Nancy said, as Professor Mathieson strolled away. "We're twins," Pamela replied with a laugh. "Fraternal of course," David added, smiling. Keith, a tall guy in his midtwenties, had a powerful chest and slim waist, set off by black jeans, a black shirt buttoned to the neck, and a black leather vest. He brushed a lock of dark hair off his face and fixed an intense gaze on Nancy. "Why are you arriving so late in the semester?" he asked. Nancy quickly explained that they were in Paris for just a couple of weeks. Then she added, "But what about you? You're here for the whole year? Are you all studying French?" "I am," Pamela replied. "But Keith is a painter and David is in art history. One great thing about our exchange program is that we can take courses in different subjects at different branches of the University of Paris." "Art history? Paris must be the perfect place to study that," George remarked. "Just think of all the great artists who've worked here." "That's true, George," David said. "And Professor Mathieson is very well known in the field. She's working on a biography of Josephine Solo, the American painter who died last spring here in Paris, where she lived most of her life. Professor Mathieson and Solo were good friends." "Solo?" Nancy said. "I think I read something about her. She was kind of eccentric, wasn't she?" Pamela giggled. "She certainly was! When she first came to Paris, she took her easel and paints outside every time it rained --" "Which is pretty often," David interjected. "Wearing a bright yellow rain suit and hip boots, the kind Maine lobstermen wear," Pamela continued. "After the first couple of times, every body knew who she was." "Her Paris Rain paintings are worth a fortune now," David declared. "Museums and collectors all over the world want them. They're in greater demand than her later work." "For good reason, too," Keith told him. "Those hyperrealist canvases she did later, with every tiny detail perfect, were technically very good, but they didn't have any of the power of her earlier abstracts." He gazed at Nancy and George again. "Come see for yourselves," he added. "There are a couple of good examples in the other room. Nancy and George followed him into the living room, where a dozen or so students were scattered around, chatting. Keith indicated a painting on the wall over the small console piano. It was of a checker tablecloth, a cup of coffee, and a plate of cinnamon buns, done in such exacting detail that Nancy could almost smell the coffee. The only odd feature in the painting was a gaunt, bluish hand reaching for one of the pastries. "The title is Depast for the Reparted," David said from behind Nancy. "Solo was playing with the words repast for the departed. That's supposed to be the hand of a dead friend. Solo loved weird jokes." "I think I'm going to have nightmares to night," George commented. "Now look at this abstract over here," Keith said, gesturing toward the fireplace. At first all Nancy saw in the painting was a swirl of muted colors, mostly blues and grays. Gradually, however, she began to sense wet streets and a brooding sky and, in the distance, the beckoning lighted windows of a friendly caf&eacute;. "It's hard to believe that the same artist did both paintings," Nancy remarked. "Why did she change her style so totally?" "Money and fame, if you ask me," Keith said. "Lots of painters were doing abstracts, though they weren't as good as hers, but she was one of the first to paint in that hyperrealist style, so she attracted a lot of publicity and made some significant sales. Not that I blame her. Artists have as much right to make money as insurance sales men." "Cynical as always," David said, with a hostile glance at Keith. Then he turned to Nancy and said, "You should ask Professor Mathieson that question. She probably knows more about Solo's life and work than anyone else in the world." Pamela stared unhappily at Keith, then at her brother. "I hope you two aren't going to argue," she said. "This is a party, remember?" She turned to George and Nancy and added, "Come meet some of the others." During the next hour Nancy and George chatted with a woman doctoral student from New York who was studying Paris street musicians, a girl from Oklahoma who had joined the program after a single semester of French and admitted that she was just beginning to understand what people said to her, and a tall, handsome dance major named James, who immediately offered George a personally guided tour of Paris. While George was arranging to meet him the next evening, Nancy took in the rest of the crowd. The party had started to thin out. Both Keith and David had apparently left, but Pamela was in the other room, helping to clear the table. She noticed Nancy standing alone and came over. "My favorite caf&eacute; is just down the street," she said. "Would you and George like to join me for a hot chocolate?" "I'd like to," Nancy told her. "Let me check with George." After thanking Professor Mathieson and saying good night to the others, the three girls went out and found a small table in the window of the caf&eacute;. Half a dozen people were standing at the nearby bar, sipping tiny cups of coffee. Outside, the street was crowded with pedestrians and cars. Pamela explained that, in addition to the Bastille Opera House only a short distance away, there were half a dozen movie theaters and music clubs in the neighborhood. She broke off to wave to a dark-haired guy in a black leather jacket who was walking past with a briefcase under his arm. He looked around and waved back but didn't stop. He quickly joined the throng of people on the sidewalk. "That was Jules Daubenton," Pamela told them. "He's Professor Mathieson's research assistant for her new book. I wonder what he's doing here at this hour? He lives over on the Left Bank. Maybe he got the time wrong for -- "
Pamela broke off her sentence. From nearby came the squeal of brakes and the blare of a truck's horn. An instant later they heard screams of terror. Nancy jumped to her feet. A man came running into the caf&eacute;, shouting. The man behind the bar reached for a telephone. Pamela stood up and stepped over to the bar, where she spoke a few words to the first man. White faced, she quickly sat down again. "How horrible!" she exclaimed. "Somebody's been hit by a truck. A young guy in a leather jacket, he says." Eyes widening, she turned to George and Nancy. "You don't think . . . it couldn't be Jules, could it?"